The idea that until guilt is proven, a criminal suspect should be assumed not to have committed a crime, underpins our legal system. It protects the innocent and avoids the horrible possibility of being falsely assumed to have committed a crime. Such false accusation is a huge fear, and one that has been extensively exploited by cinema. It’s a theme which is extremely prevalent in the work of Hitchcock with The Wrong Man being the most obvious example. 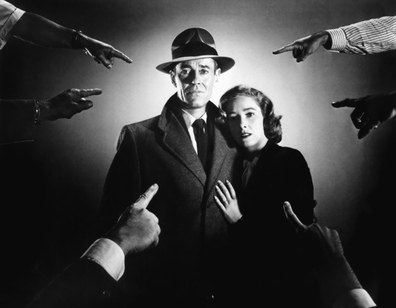 Henry Fonda’s character, Manny Balestrero, is falsely identified as having held up an insurance office. The innocence of Balestrero is never in doubt, shown by the title, which is why it plays to our fear of being falsely accused so strongly. As the evidence mounts against him his situation gets more and more desperate as he’s apprehended and processed by police. This is a theme revisited by Hitchcock time and time again. In many of his other films it’s the crime itself that’s the focus of the film, with the false accusation forming a more peripheral role, but being present nonetheless. This is true of Strangers on a Train, in which a tennis player called Guy (Farley Granger) meets Bruno (Robert Walker), on the titular public transport, who has a plan for committing murder and getting away with it. The idea is for them both to murder someone in each other’s life, with whom they have no connection, so should, in theory, not be caught. Guy wants to get rid of his wife to be with the woman he loves, but rejects the proposition nonetheless. Bruno misunderstands, however, and goes ahead with his side of the deal, killing Guy’s wife, for which the tennis player becomes the main suspect. This theme was again used in Hitchcock’s penultimate film, Frenzy. This takes place in London where someone has committed a string of murders by strangling women with a tie. This is one of his more violent films, being made in 1972. With the string of murders we see it feels like a very early slasher film in places. What we feel for the falsely accused Richard (Jon Finch) is enhanced by the highly publicised brutality of the crimes in question. Another film which shows Hitchcock’s ability to put his characters through hell and back is his lesser-known I Confess from 1953, which added the theme of testing one’s convictions to the false accusation storyline. It follows a Catholic Priest, Father Michael Logan (Montgomery Clift), who hears of a murder in confession. He is bound by religious duty not to divulge the information to police, and is tested to his limits as he becomes the main suspect in the murder case. While the predicament of Father Logan may be harder to relate to, being, in some senses, self-inflicted, it certainly adds an interesting new dimension to the theme of being falsely accused. Clearly this is a prevalent Hitchcockian theme, but it’s been popular with other filmmakers too, usually because someone has been framed. In Enemy of the State, for example, Will Smith’s character is framed for the murder of his former love interest after he gets on the wrong side of the National Security Agency. In The Negotiator, Samuel L Jackson plays a hostage negotiator who is framed for a murder after coming close to discovering corruption in the police force. He’s forced to take hostages himself to prove his innocence. In Shooter, Mark Whalberg is framed for the murder of the president, no less, and goes on the run from the FBI as his image is plastered on TV screens. But my favourite contemporary example of this is a film I consider to be a spiritual successor of Hitchcock: Phone Booth. It’s a masterclass of suspense, managing to be incredibly gripping and expertly paced during its brief 81 minute runtime. 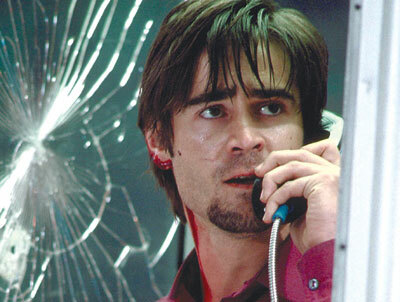 A vain publicist called Stew (Colin Farrell) is held hostage by a sniper in a New York phone booth who has made it look like Stew shot a man in the street. The evidence is completely against Stew as the media, and ranks of armed police, look on. The desperation of Stew’s situation takes him from a shallow, detestable narcissist to a helpless victim in a way to rival any of Hitchcock’s innocent characters. Meanwhile both his wife and girlfriend arrive at the scene, further increasing the strain on Stew. Another crucial aspect of a false accusation film is trust. In a thriller where someone has to prove their innocence there’s inevitably a scene where the innocent character seeks out one of the few people who believes, or may be persuaded to believe, their innocence, usually while their face is being broadcast on the news declaring them a suspect. This usually takes the form of a love interest, such as in Enemy of the State when Will Smith, on the run from the NSA, pops up in his wife’s garage; when Tom Cruise is on the run in Minority Report, he visits his ex-wife; and in Shooter Mark Whalberg seeks out his dead friend’s widow. Usually these scenes involve a frantic attempt by the suspect to persuade the confidante of their innocence before they call the police. This demonstrates the isolation of the character, as if everyone in the world, bar perhaps one person, believes them to be guilty. This brings up important issues about the way we tend to assume someone has committed a crime if they are suspected of doing so. The fact that the confidante usually has knowledge of the alleged crime through the news also brings up the idea of trial by media. During our series on surveillance I reviewed the documentary Taking Liberties which included the case of Mouloud Sihali, put on trial for the charge of manufacturing a poison, ricin. No serious evidence was brought forward against him (some the jurors felt so bad about his ordeal they now provide him with support) but he has been under house arrest since he was acquitted. In the eyes of much of the media, and, in some cases, policy makers, the mere fact of his arrest is enough to treat him as if he is guilty, with no compensation whatsoever for the way public opinion was manipulated against him. Sihali’s situation emphasises the importance of innocence until proven guilty and how cinema can play to this fear. Seeing his story it’s clear there can be few fates worse than to be condemned for a crime you haven’t committed, which is why this has been such an important theme in the thriller genre. What are your favourite films based on false accusation? Comment below.